The reconstruction of the former bank building was a lengthy process, according to Olivo, who says the structure had to be re-roofed and tuck-pointed. 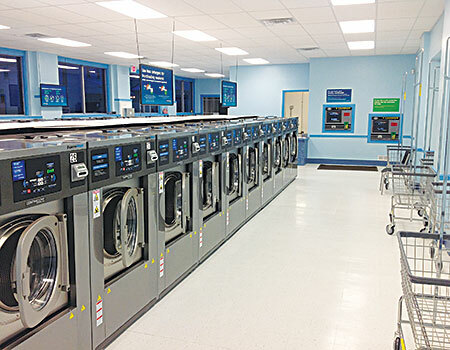 Olivo employed the assistance of Scott Vlahos, of distributor Advantage Equipment, in outfitting the store with Continental’s ExpressWash soft-mount washers and ExpressDry dryers. 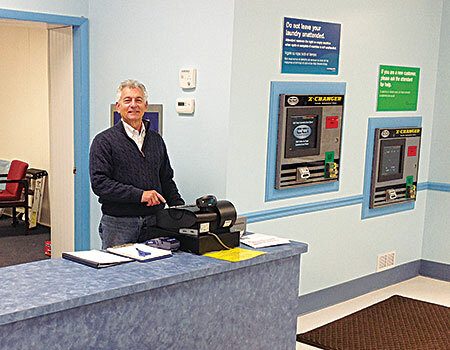 Olivo (pictured) also equipped his store with Card Concepts Inc.’s FasCard system, which allows him to remotely manage his laundry machines via the Internet. He also utilizes the system to operate a customer loyalty program and establish time-of-day pricing. “The people are nice, and I like this neighborhood,” says Olivo of his store’s clientele. The laundry caters to young and old alike, and, since opening, has served more than 2,500 customers. CLEVELAND — An extensive renovation and the installation of freestanding equipment morphed an old bank building into a high-speed laundry. Located in the Clark-Fulton neighborhood of Cleveland, the new 3,500-square-foot Express Laundry Center delivers a 60-minute wash-dry-fold, card access and customer care, among other amenities. 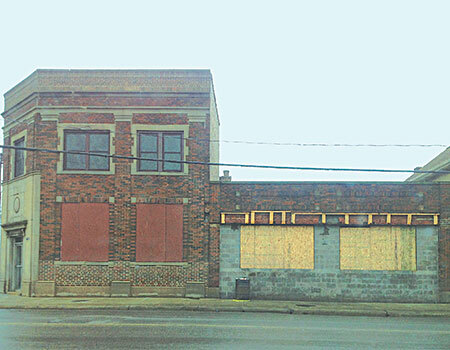 Retired schoolteacher Joe Olivo purchased the Federal Bank Building at the end of his teaching career. “Over the next few months, I did research on laundries,” he says. Vlahos, of distributor Advantage Equipment, assisted Olivo with the bank’s renovation and redesign. The laundry took form around an old vault, which became the office, and 18-inch walls. 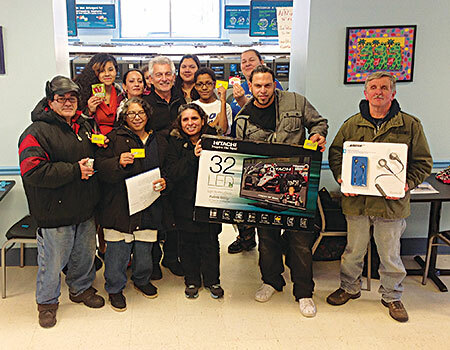 In November 2013, the fully attended Express Laundry Center hosted its grand opening. Key to the laundry’s success is its equipment, according to Olivo. The Express Laundry Center features a mix of ExpressWash™ washer-extractors, including 14 20-pounders, 11 30-pounders and 10 40-pounders. Fourteen Continental dual-pocket stack ExpressDry™ Dryers; the Card Concepts Inc. FasCard™ system; vending and snack machines, as well as wash-dry-fold service round out the store’s offerings. The freestanding ExpressWash washers provide a 60-minute wash-dry-fold, simple installation and lower utility costs, among other benefits. The washers produce extract speeds up to 354 G-force. In doing so, according to Vlahos, ExpressWash washers remove more water during extract, which decreases resulting dry time by up to 50%. “High-speed extract improves customer turnover, getting customers in and out in under an hour, which works to boost profit potential,” he says. Reduced drying time translates into reduced dryer operation and natural gas usage, as well. 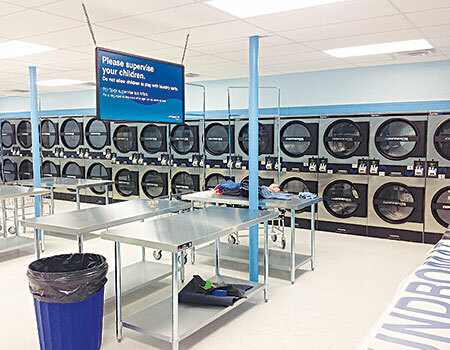 While utility costs at the average coin laundry make up 26% of gross revenue, according to a Coin Laundry Association industry survey, utilities at the Express Laundry Center make up just 15%, according to Olivo. The store features a Card Concepts Inc. FasCard™ system, which accepts credit and debit cards, and interfaces with Continental laundry equipment. The computer interface allows Olivo to program machines through the card system and view washer operation statistics remotely from a computer, tablet or smartphone, via the Internet. He can also go into the exchanger remotely and issue cards, check what machines are doing, or find out how much money was generated that day. The remote store-management system allows him to see what’s going on and respond quickly if there is a problem. Olivo uses the card system to launch loyalty and bonus programs, and schedule time-of-day pricing. Fully attended, the Express Laundry Center is open from 7 a.m. to 11 p.m. daily. Located in a low-income and ethnically diverse area, the laundry caters to young and old alike. “The people are nice, and I like this neighborhood,” says Olivo. Since opening, the store has grown to serve more than 2,500 customers.